Activate Aurora POS on any desktop computer, laptop or Tablet, and start selling! Connect your Thermal Printer(s), Bar Code Scanner(s) and Cash Drawer(s) seamlessly. We even purchase/rent the hardware for you! Connect from anywhere to check your sales reports and inventory. A new branch or a new Cashier, you grow and we will manage the rest. Grow your Business, we got you Covered! Expanding to online selling and E-Commerce, or a Powerful CRM (Customer Relationship Management), cannot get easier. All our products can be integrated. Manage your E-Commerce website from within your POS, and feed Leads and Customers information from your POS and Website to your CRM. Get in touch and ask about our integrated solutions! Expand your POS to a full-fledged CRM and capitalize on those relations! Set the same product in different sizes, colors or configurations. Add and configure multiple barcodes for the same product. Keep track of sales and totals for every payment type or product. 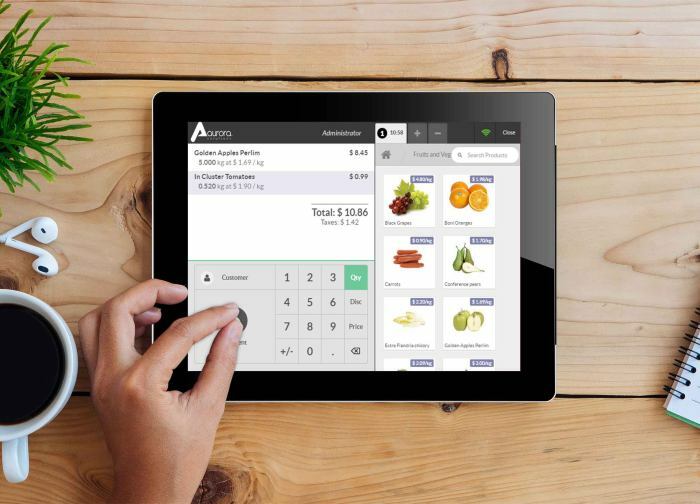 Monitor & Track multiple franchises and cashier accounts. Manage your stock across all Locations and set notifications. Cash, Credit/Debit cards, and custom payment methods can be integrated. Generate and print customized invoices and receipts. Auto-add taxes, split payment of single order, and offer customers to tip. Add Discounts on single products or entire orders. Switch between orders and process multiple orders at the same time. Register new customers via emails, addresses, and phone numbers. Lookup your loyal customers and track their sales & interactions. Auto-add loyalty points or discounts to your regular customers. Integrate with Aurora CRM to unlock all the potential. Ready to manage your store better?